“Izaya… You’re Izaya after all “. 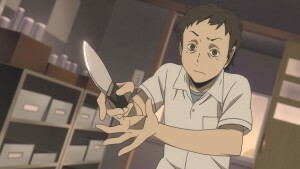 This is the second week in a row where we’ve got an episode that’s focused on Orihara Izaya, and it doesn’t disappoint. 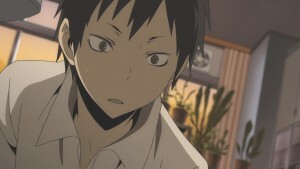 One of Durarara! !’s greatest strengths is in its characters. There’s a lot of good ones in the cast, some of them pretty easy and plain to read, while others are enigmas that you continue to learn more and more about with each episode. 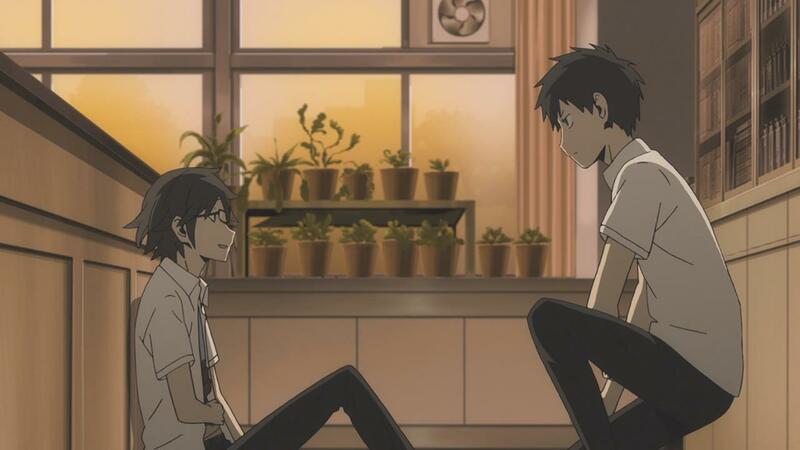 This week delved into Izaya and Shinra’s middle school days, and gave us some insight into just how the two became friends. 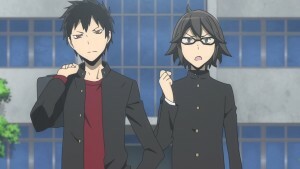 Unsurprisingly, it seems that both of them have been pretty twisted from the get go, going as far back as that time. 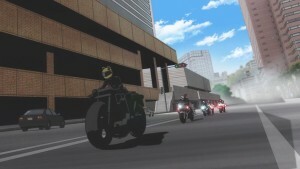 Shinra’s always had his obsessive love for Celty driving all his actions, while Izaya’s always been interested in messing with people while simultaneously calling it “Human Observation”. 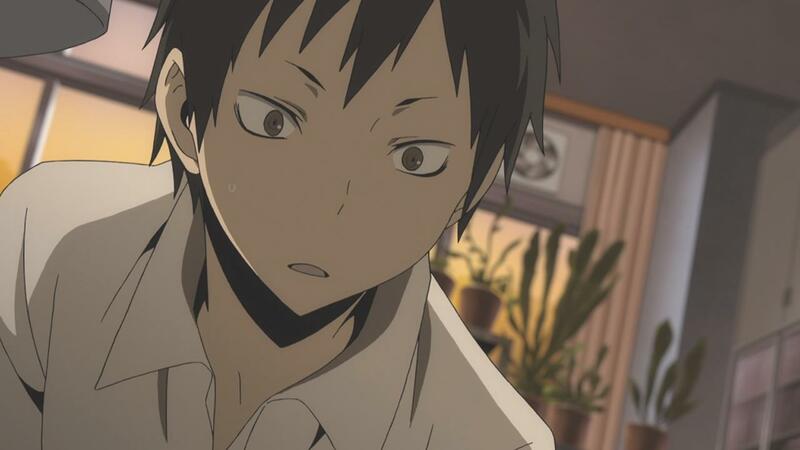 The big contrast from the present day though, is that Izaya in middle school was a lot more quiet, cold and unfriendly, as opposed to his creepy cheery demeanor now. 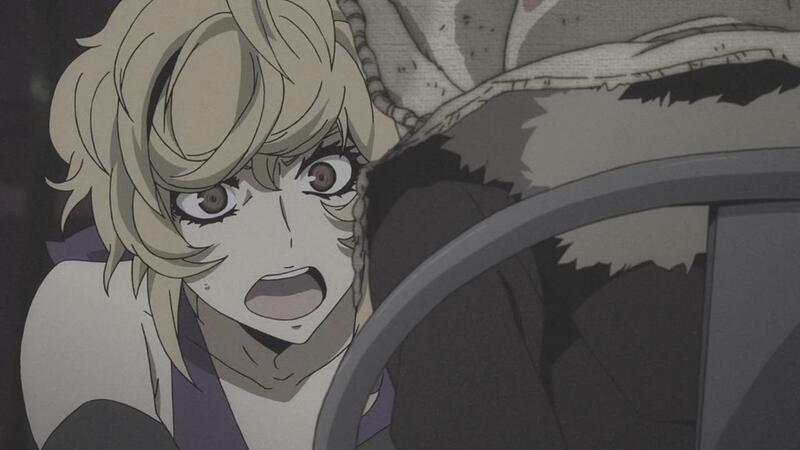 Beyond that, however, there really wasn’t much to glean from the little flashback story itself, except for maybe who or what a certain individual named Nakura is. If you’re thinking you’ve heard that name before, you’re right. 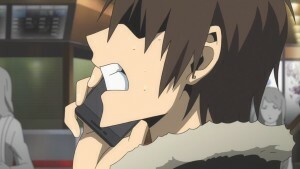 Its actually the online alias that Izaya uses in the Dollars Chatroom and in some of his more shadier dealings. The really nice revelation though, is that Nakura is an actual person, and he’s been used by Izaya in a number of situations. One such situation was none other than to twist the little Akane’s mind into wanting to kill Shizou earlier in the series. 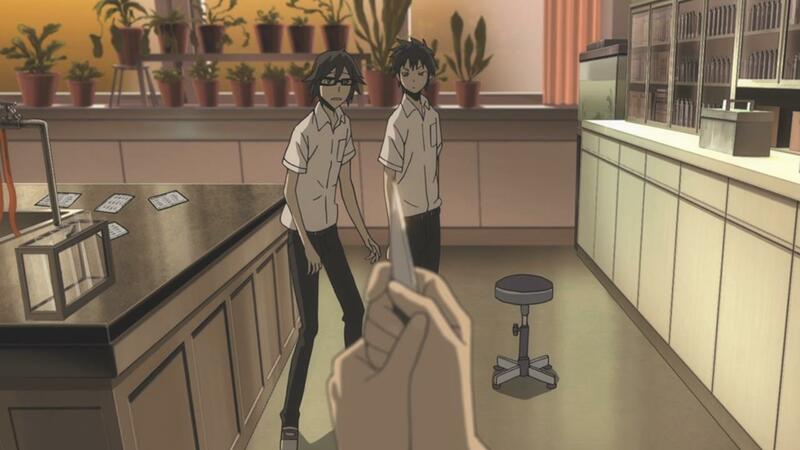 Nakura, it turns out, has been used by Izaya all over the place, and it all stems from the fact that both Shinra and Nakura went to the same middle school with him. 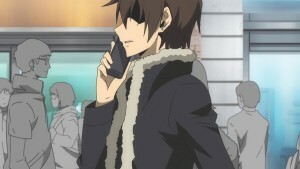 Izaya being Izaya, was running illegal gambling activities even then, and Nakura was one of the kids with a gambling problem that fell victim to his schemes. 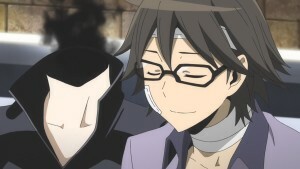 In a surprise accident, Nakura ends up stabbing Shinra who moves in to protect Izaya from the dangerous blow. The effect this whole act has on Izaya, is profound. I suspect this is the one point where Izaya begins to consider Shinra a true friend in his own way. In response to all of this, Izaya actually asks to be held responsible for the stabbing and promises to punish Nakura for the rest of his life in exchange. 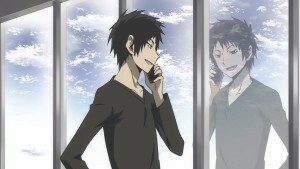 Its revealed through a conversation between Izaya and Nakura in the present day, that he seems to be making good on that promise. We find out that both Amphisbaena and Heaven’s Feel’s leaders are the same person, Nakura. 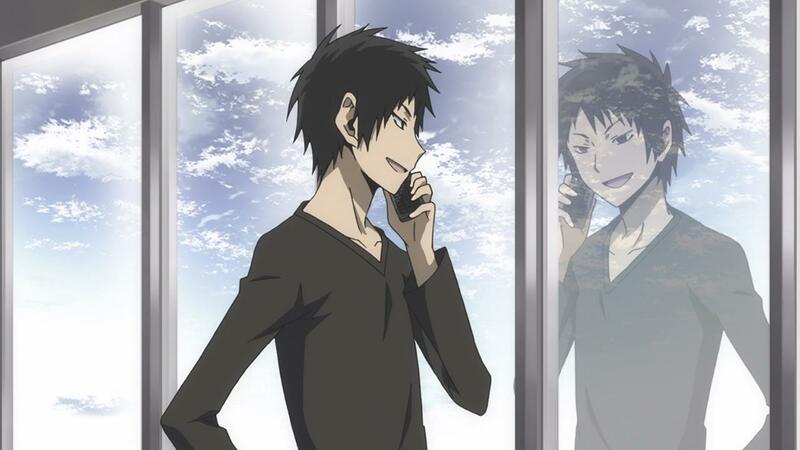 It seems Amphisbaena was a baseball gambling ring that Nakura and Izaya started in high school while apparently Heaven’s Feel no.2 Shijima also had ties to Nakura during the same time. 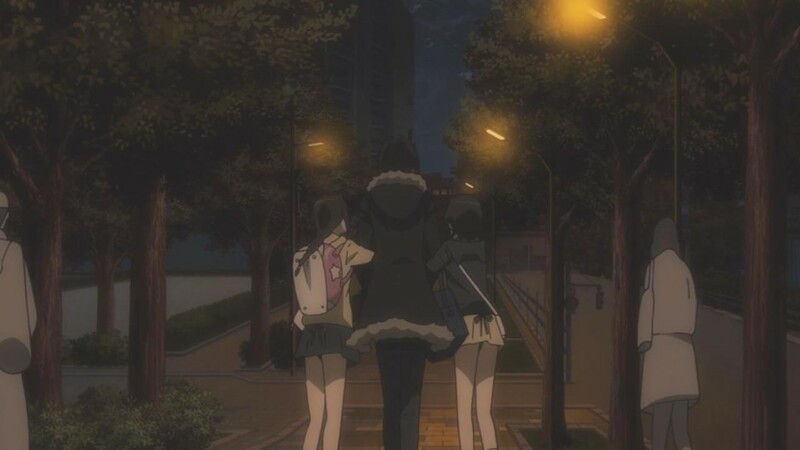 What’s interesting is that both these groups that Izaya took care of in the last episode, had been somehow inspired by some of Nakura’s old aliases, The Lizard and Kumoi-san. 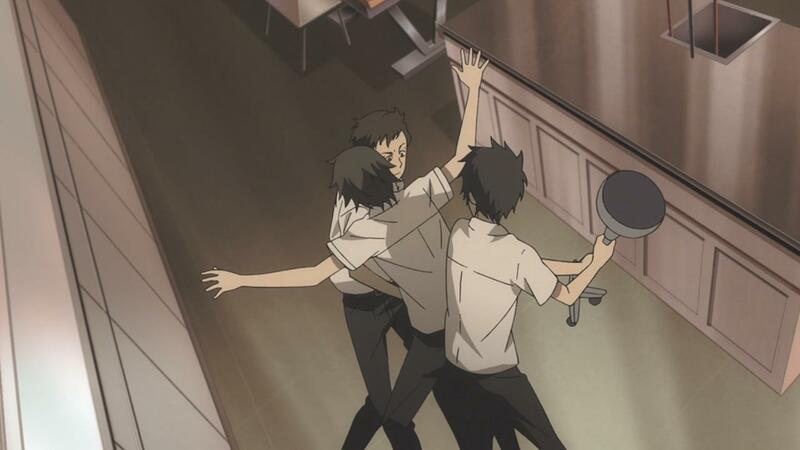 In essence, it seems that Izaya’s activities in high school spawned these two groups and their crazed leaders, and it all ties back to an unsuspecting Nakura who had no idea what was going on. And that revelation is… Interesting. It ties up the whole issue of the two groups shadow leaders up nicely, but its also kind of a letdown. 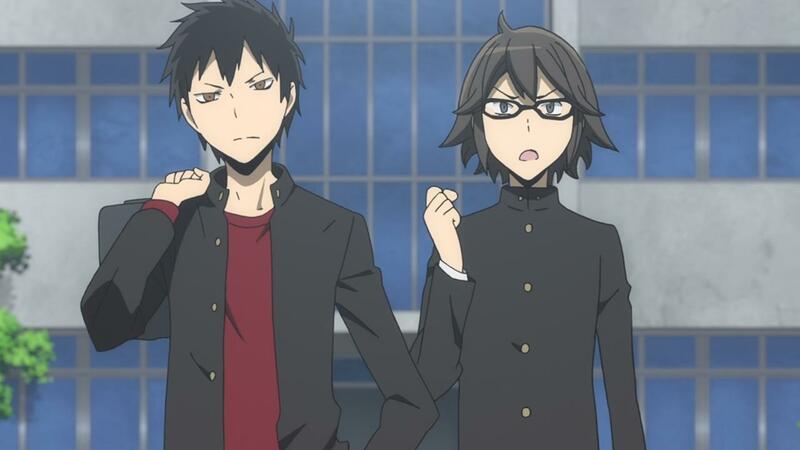 These two new groups were nothing more than two entities created based on a lie and tangentially related to the stuff that Izaya did in his formative years. 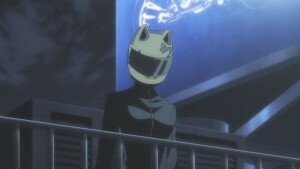 I always had a feeling that there might be more to it than that, but I guess Durarara!! 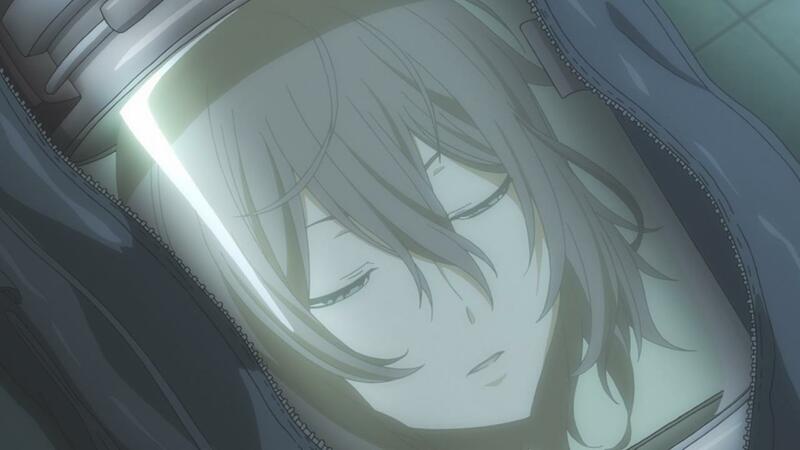 was done with this particular plot thread and just wanted to wrap it up. It was later in the day, however, when the really notable things happened. 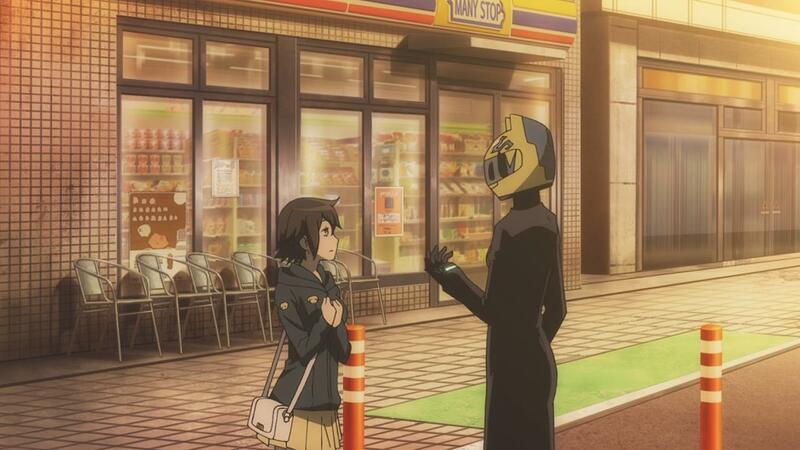 While Izaya ends up saving his sisters with Celty’s help (or using them to distract her? 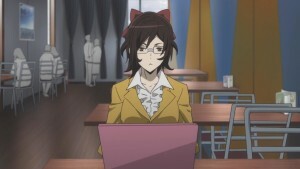 ), she ends up finding some key info out as well. Celty’s fully aware of the fact that Izaya now has her head. She’s not sure why, but for now it seems like she’s fine with letting sleeping dogs lie. 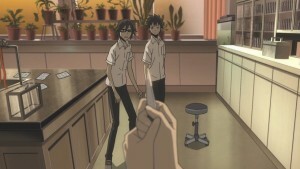 Yet, this changes their dynamic, and that of the series quite dramatically. How things go on from here, I’m truly curious to see. 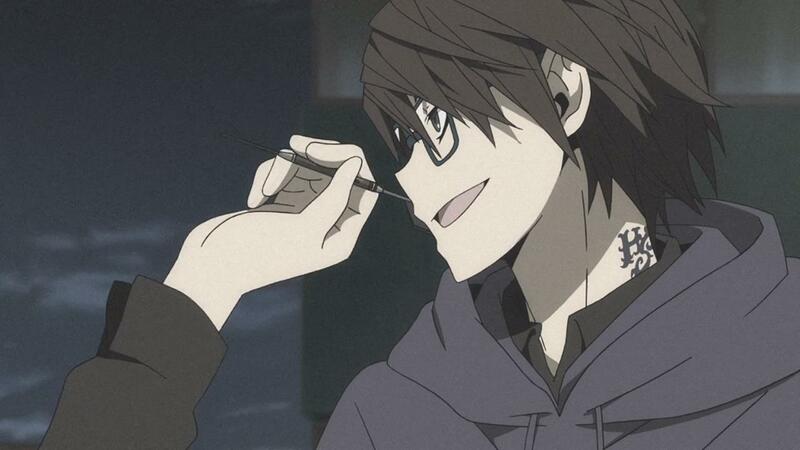 There’s one other tidbit in that conversation with Izaya, and that’s the fact that he’s pinned the whole stalker situation on Yodogiri Jinai. He’s not completely wrong, except for the fact that, obviously he actually knows where said stalker is. But while Izaya giving anyone the run around isn’t anything entirely new, it is worth noting that he’s very much “tracking” Jinai now. 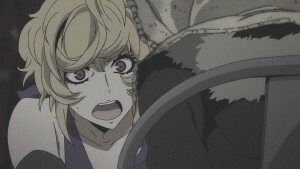 That implications of that are pretty clear, in that we’re getting a rematch between Izaya and Jinai, and it’ll be interesting to see which monster comes out on top. But we’ll actually have to wait two weeks before we actually continue the current story. 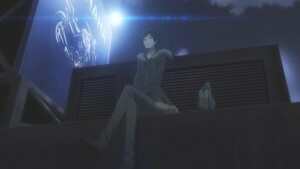 It seems like next week will actually be playing the 12.5 OVA from the last series, and then we’ll end up getting episode 22 the following week after that. I’m assuming there’s been a production issue, and instead of a recap we’re pretty much getting next week off. 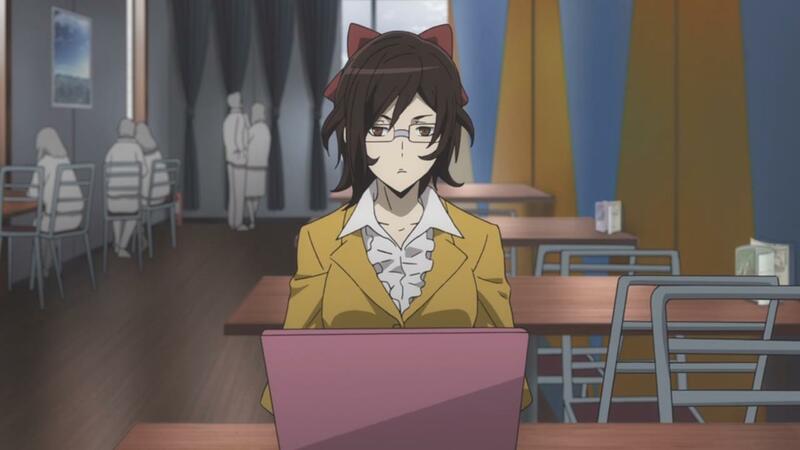 With this story wrapped up, and only three episodes left to go, this seems like a good time as any for a small break. Hopefully Durarara! !x2 doesn’t lose the momentum it built back up in it second cour.